3 more Friday's left until the end of the year! Time to buckle down and get the next few exams completed. We nearly there! Please take note of the following. Please support this campaign and initiative to improve security on our campus. 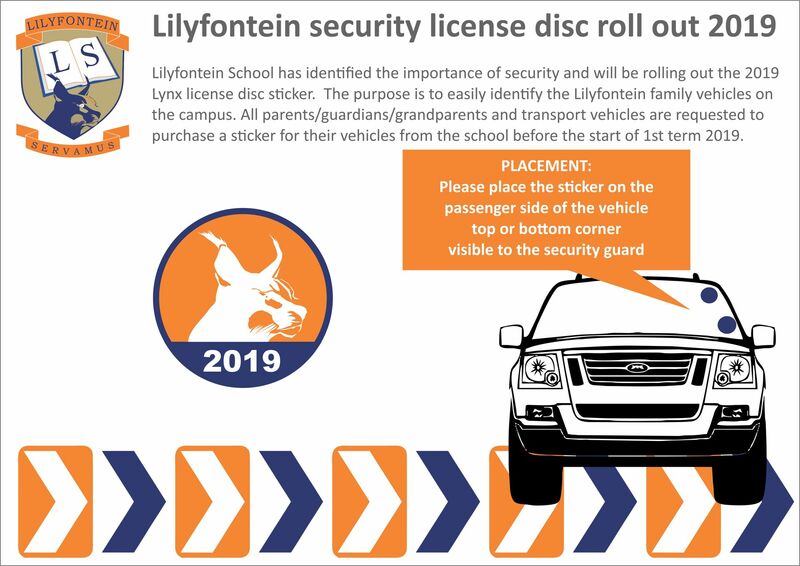 We request that all parents/guardians or drivers collecting and dropping learners off at school purchase a disc at a cost of R50. Your support is appreciated. THANK YOU TO OUR SPONSORS: Massive Thank You! 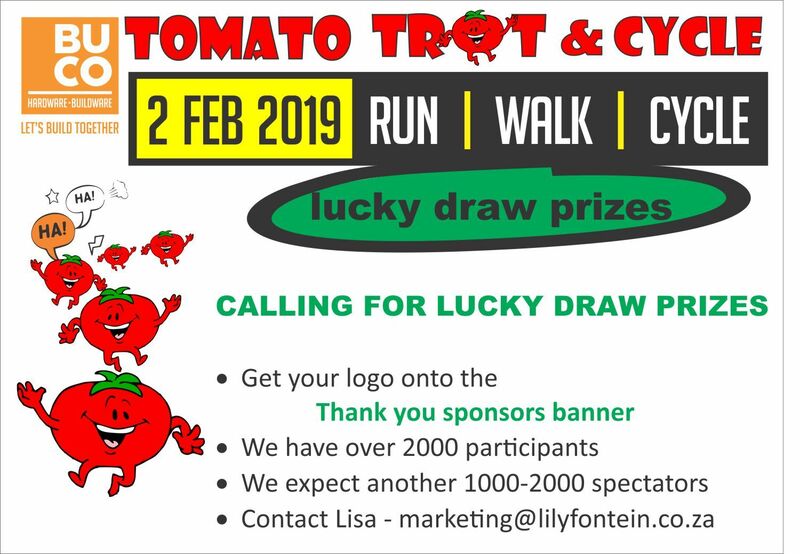 Anyone interested in donating lucky draw prizes for the Tomato Trot & Cycle please contact the marketing department! Thank you to the parents/guardians for always assisting and volunteering to make our school great! Please consider joining the dynamic PTA team in 2019, more hands make light work. Together we are stronger! Congratulations to all our Lilyfontein families, friends, learners, staff and educators. Our ECO Department attended the Call2Action Green & Clean City Awards Ceremony last night. 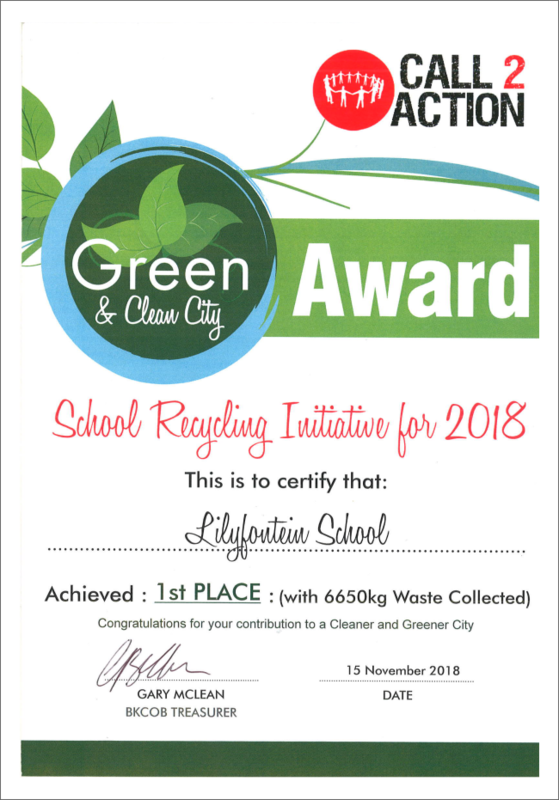 Lilyfontein won the School Recycling Initiative for 2018 by collecting 6650kg of waste. This is a massive effort as we were competing against bigger schools. Thank you to all who contributed to the success of this award, we are walking the talk and flying our ECO flag very high and proud! The Adventure Department are requesting donations of the following items that they would like to incorporate into their upcoming programmes and events: Newspapers, egg boxes and 2l cooldrink bottles. Should have any of these items at home and would like to donate them, please send them to school with your child. Thank you. 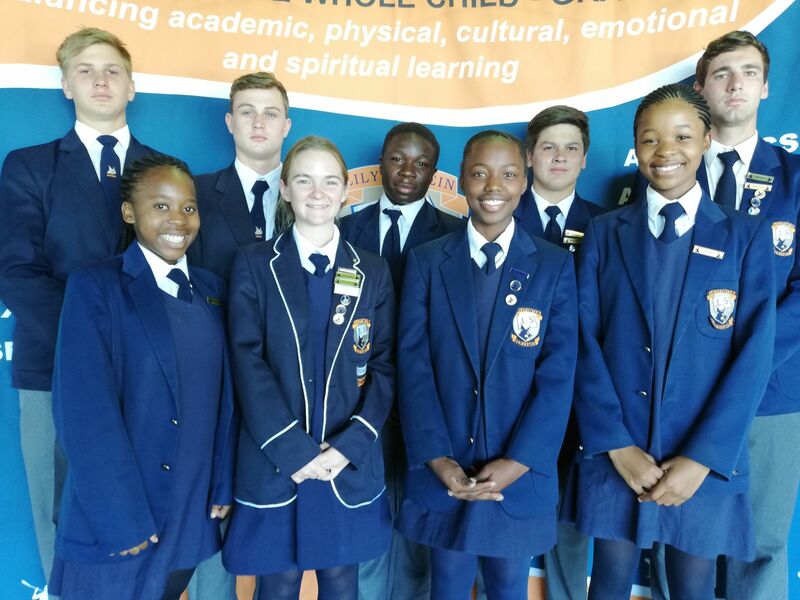 The Afrikaans Department is looking for props for the Afrikaans class to make the teaching of literature more interesting to the learners. Any parent/grandparent who may have these items lying around, gathering dust and would like to donate them to the school, they are needing: Top hat, bowler hat, tail coat, waist coat, white frilly shirt, judge's wig, apron, old fashioned ladies shoes/boots, toy sword, cricket bat, army coat. The Afrikaans Department are also looking for Afrikaans magazines eg. Huisgenoot, Sarie, Rooi Rose, Weg, Wiel, Stywe Lyne, Jag and Vroekeur. Please send these items to Mrs Middleton.Thank you. Well done girls and Good luck for a super show!!! This week the grade 4 #Lilyfontein learners had to create a product, plan it, design it and sell it in the form of a poster. The imagination is priceless. Well done grade 4's, your future is bright! Kate Drummond is living proof that it is never too late to follow your dreams. Grade 1 - 2019 Parent meeting.